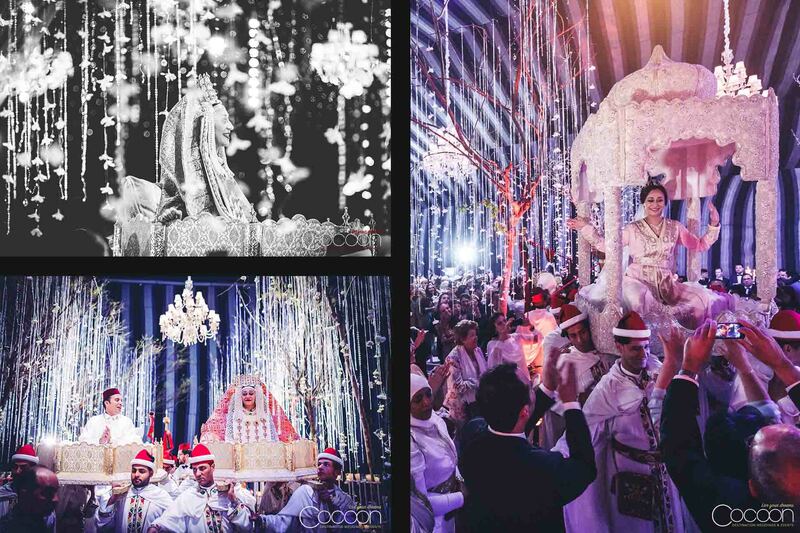 Amine and Sofia came to us with a simple white party concept for their 1001 Nights in Marrakech wedding. 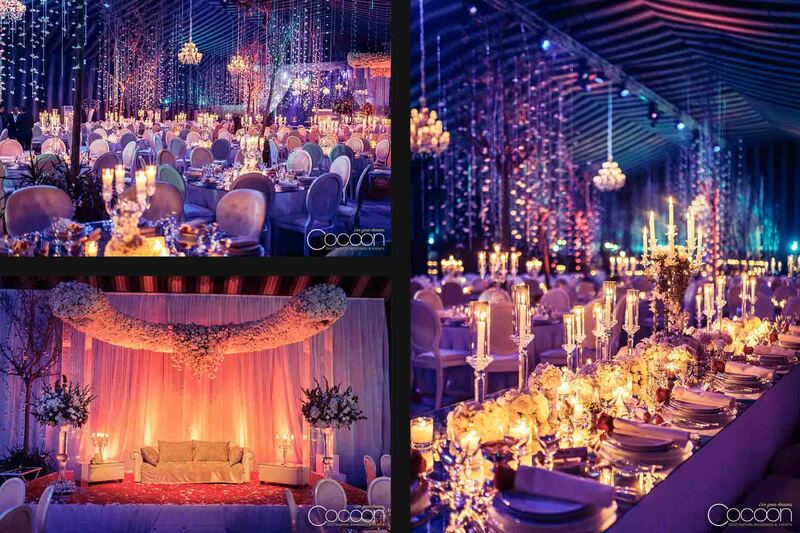 After a few meetings and getting to know the couple better, our team of expert international luxury event planners presented a custom twist on our award-winning rainforest concept: a twinkling crystal wonderland inspired by the outdoors but elegantly constructed beneath a great marquee. Sofia loved the idea and gave us carte blanche, trusting our team 100%. 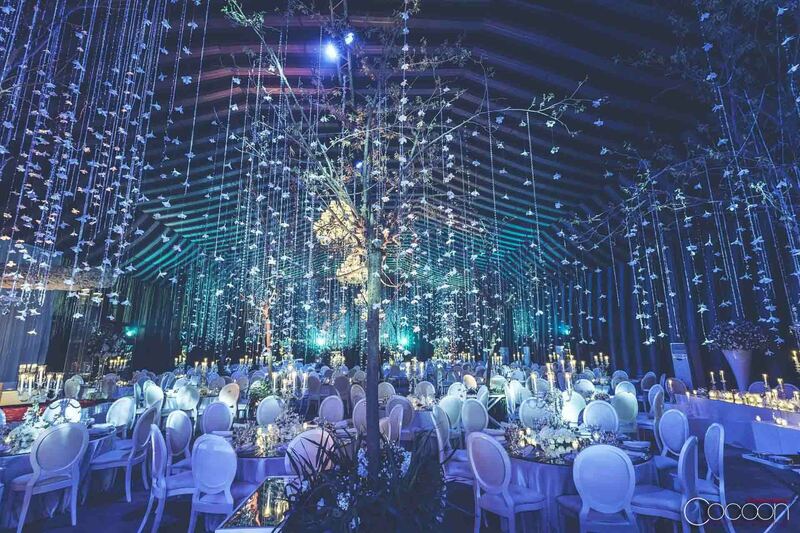 In order to create the fairytale setting, we brought in 50 full-size trees and artfully placed them inside a grand 1000 square-meter marquee to symbolize a forest teeming with life and beauty. 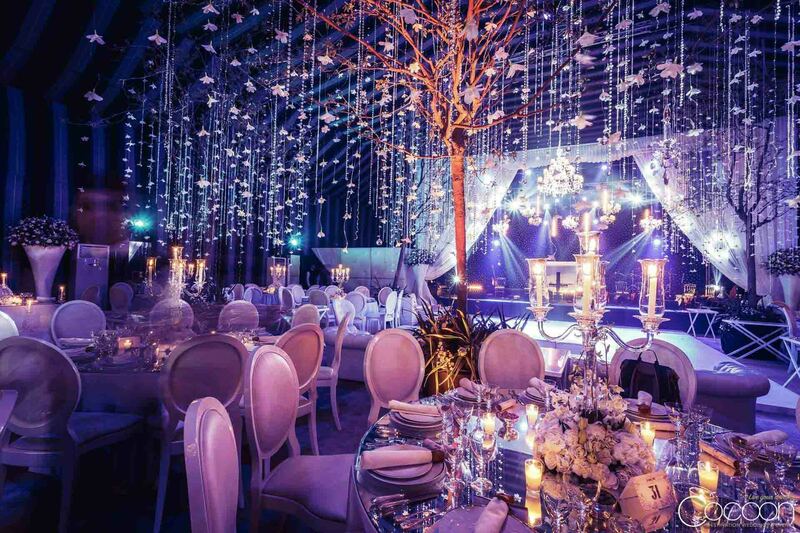 30 kilometers of diamonds rained down from the ceiling to the elegant Swarovski crystal chandelier centerpieces, surrounded by 400 lush plants on mirrored tabletops. 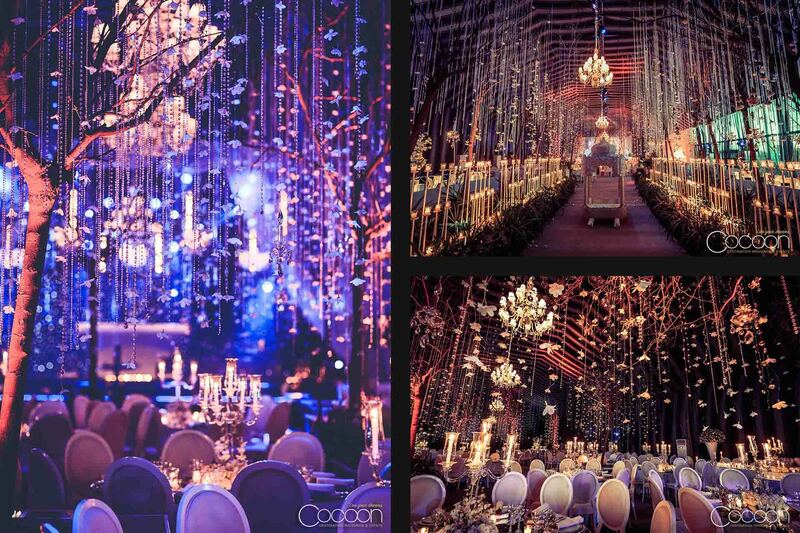 The entire scene was professionally illuminated with custom LED lighting, giving the scene an other-worldly atmosphere. A lounge area fit for royalty awaited Sofia and Amine, elevated just slightly above their audience and perfectly staged so they could welcome their awaiting guests while observing all of the night’s festivities. An enormous hanging installation in the shape of an arch, and densely decorated with pure white flowers floated above a loveseat for two, flanked by urns overflowing with even more blooms and elegant candelabra to provide a romantic glow. 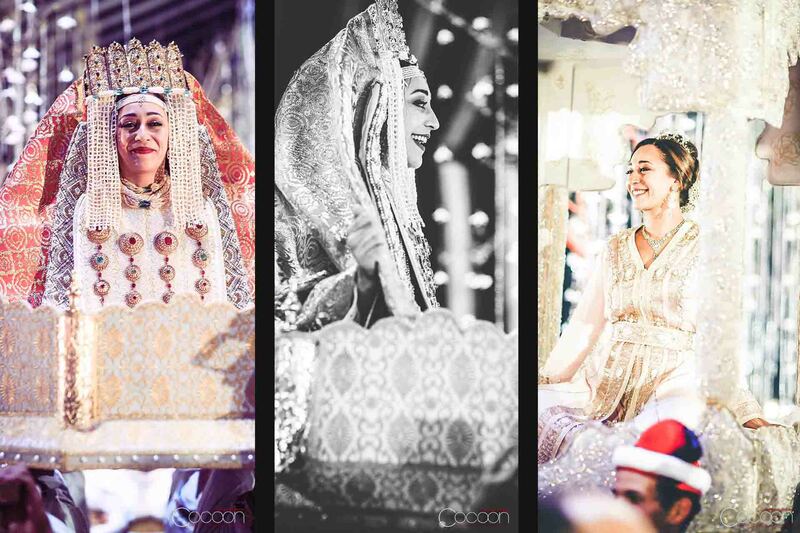 Amine changed gowns several times during the evening, honoring a variety of the couple’s traditions as well as the local culture. Each place setting was complete with gleaming silver flatware and one beautiful red rose. Guests experienced the entire evening with all of their senses. 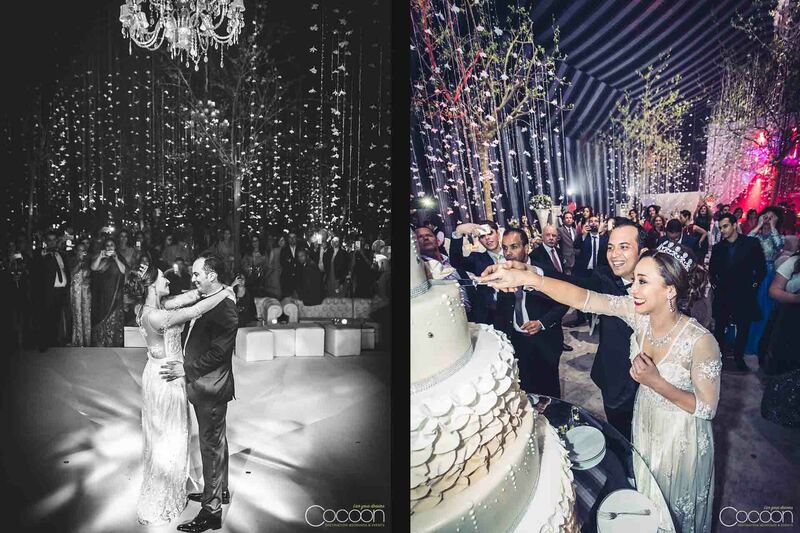 Our wedding planners in Marrakech created a look of pure glamour and an event full of excitement and anticipation, setting the stage for an elaborate, romantic celebration of Amine and Sofia’s love.